This blog post was originally published on October 25, 2016. Are you racking your brain on finding analytics software that will match your business needs? Then we’ve got a great news for you. In our freshly updated comparison, you’ll find 5 of the most popular analytics solutions side-by-side for you to see the key differences between them and decide what’s your best pick. Sounds good? So, check it out! Web analytics tools have changed the way we make decisions in the digital world. Thanks to web analytics we don’t have to guess about what our customers and users want. We can get detailed information on anything we want, and optimize our digital activities to increase ROI, improve the user experience, and do a number of other things to move towards our business goals. Web analytics software has evolved a lot since the beginning of the Internet, and right now it is in the prime of its life. There are dozens of great solutions with various functionalities, but which one is right for you? Although for most small and medium-size companies Google Analytics remains the obvious choice, the game has changed for enterprise-level organizations. The aim of all enterprise web analytics vendors is very similar, but with different tools come different functionalities and services. There is no one-size-fits-all web analytics solution. That’s why you should research, dig, ask questions, and test. This post is the right place to take the first step. Here we’ll give you an overview of 5 the most popular web analytics tools, particularly those recommended for enterprises and other large organizations. After reviewing it, you should be able to reject those which don’t satisfy your primary requirements. We’ve already discussed here and here what should you consider during the decision process. Remember that if you decide to invest in enterprise web analytics software, make sure you have sufficient development, analytics, and management resources within your organization. Even the best and most expensive web analytics tool will fail to give you insights if it’s in the hands of an underskilled employee. There is glory awaiting every marketer and business owner who understands data and uses it to make the right business decisions. Choose your analytics soulmate and march together down the path to glory. 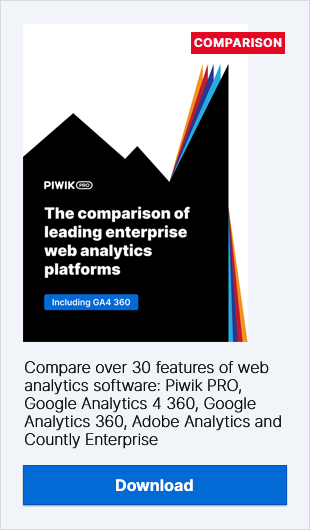 If you’d like to compare the specifications of the web analytics vendors discussed here, download our free Web Analytics Tools Comparison sheet. We have detailed over 40 functionalities and placed 5 of the most popular analytics solutions side-by-side for you to see the key differences between them. Google Analytics 360 (formerly Google Analytics Premium) is a premium version of the most commonly used analytics software – Google Analytics. It was announced on March 15, 2016, along with the entire Google suite comprised of six products (Google Analytics, Google Optimize, Google Audience Center, Google Tag Manager, Google Data Studio and Google Attribution). GA is a well-known standard solution for tracking, analyzing, and reporting website data. According to W3Techs, it controls 83% of the market and is believed to be the most comprehensive solution available. And, of course, it is free. On the other hand, Google Analytics 360 targets enterprise-level organizations. It includes SLAs, technical support, and extended limits for the number of hits. Its customers include Panasonic, 1stdibs and Domino’s. As we’re getting more and more digitalized and using multiple devices on our way to conversion, analytics data may be not as reliable as it should be. The biggest advantage of GA 360 is its connectivity with other Google products. GA 360 connects different data sources in one place, which makes it a comprehensive resource across all user touchpoints. It is also valued for clear data visualization, custom reports, and the extensive library of expert books, articles, blogs, and other valuable content around it. Choosing GA 360 means you make a commitment to Google. You agree to pass your entire digital activity data to the digital giant, which may be a source of concern for organizations handling sensitive information. Pricing lacks flexibility and cannot be adjusted based on the functionalities you actually use. Moreover, even if data limits are extended, going premium still leaves you with the problem of data sampling for high volume traffic. Webtrends has been a leading analytics and marketing company since 1993. Webtrends analytics is offered in the SaaS model (self-hosted version is no longer being supported). It is a highly customizable tool providing page-level clickstreams. It services thousands of enterprise customers offering advanced analytics and support. Its customers include Microsoft, KLM and Toyota. The great thing about Webtrends is its heatmap feature, which allows you to make data-driven decisions regarding design. Moreover, it offers custom reports. It doesn’t integrate particular smoothly with third-party products, but its SharePoint integration works better than any other. It has fewer mature integrations with other products and databases than its competitors has. The biggest disadvantage, however, is that it allows for re-analysis of past data only as far back as 120 days (unless you use web log analytics or decide to pay extra for longer data retention). Adobe Analytics is a part of Adobe Marketing Cloud. It is the result of a series of acquisitions between 2007 and 2014. Adobe Analytics is based on the SiteCatalyst solution by Omniture, which was acquired by Adobe in 2009. It lets you measure the performance of your websites and marketing activities and is highly customizable for users with the right know-how. Adobe Analytics can be integrated with other Adobe marketing products. It offers advanced segmentation, real-time automation, ad-hoc analysis, and many others. Adobe Analytics is used in the enterprise environment and provides support and consulting to its clients. Adobe charges based on every 1000 server calls (Page Views + Downloads + Custom Events) generated from the client’s website. Its customers include Sony, Asos, and B&Q. For a savvy marketer, this is a real heaven of various features and functionalities. Especially when it comes to segmentation capabilities, it offers flexibility and customizability. Adobe Analytics is a strong competitor due to its enterprise functionalities (like sharing reports and segments with auto-update) and unsampled reports. Adobe Analytics is thought to be one of the most expensive solutions on the market. It also requires some skilled analysts (including technically) to make use of all the features and set the platform up properly. It integrates well with the whole Adobe Marketing Cloud, but it works poorly with Google products. Etracker Web Analytics was established in Germany in 2000. This cloud-hosted solution is a standard tracker of digital activity. It praises itself for being a privacy-compliant solution, in line with German data protection laws. Another selling point of this analytics vendor is their compatible products: Visitor Voice (qualitative surveys) and Web Controlling (correlating data with industry benchmarks). Etracker has an integrated heatmap which shows you where users scroll and in which areas they use their cursor. Additionally, you can monitor single user sessions for customer journey analysis. The entire customer journey can be replayed in a form of a video. These functionalities are available with their User Experience Analytics. Piwik PRO was established in 2013, in Poland. The main philosophy behind their products is to deliver enterprise-class analytics while supporting data privacy and security. In 2016, Piwik PRO launched a Tag Manager solution under their brand, which became a part of the Piwik PRO Analytics Suite. Piwik PRO is designed for medium-sized companies and enterprise-level organizations. It comes in both an on-premises and cloud-hosted model (with servers in Germany, Netherlands and United States), depending on the client’s requirements. Each product adheres to the strictest privacy and security regulations while ensuring its partners retain full data ownership. Considering drawbacks, it doesn’t integrate as well with Google products as GA (obviously), and there is no option to access raw data with a BigQuery. Moreover, you will need a skilled technical team or premium support if you decide on the self-hosted version. If you’d like to compare the specifications of the web analytics vendors discussed here, download our new free Web Analytics Vendor Comparison sheet. We have detailed over 40 functionalities and placed 5 of the most popular analytics solutions side-by-side for you to see the key differences between them.